Raise for the Roses - The Junior League of Boston, Inc. 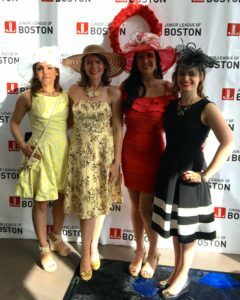 The Junior League of Boston invites you to dress in your Kentucky Derby-best (this means hats too, ladies!) and enjoy an evening of raffles, games, cocktails, light bites, and more. So raise your mint julep as we Raise for the Roses! All event proceeds support the mission of the Junior League of Boston. Members may buy tickets for themselves here. Non-members and member guests may buy tickets on Eventbrite.